The NCAA Frozen Four is a gathering where childhood dreams come true on an annual basis. When the nation’s top quartet of college hockey teams hook up at a neutral site, only one gets to go home with a shiny gold trophy. Going back to the 1950s, when college hockey was a relatively new thing, the “usual suspects” like powerhouses Michigan, Boston College, Denver and North Dakota have dominated the game. But every now and then, a smaller school – one of those institutions of higher learning that doesn’t have a football or basketball team playing on national TV every weekend – would crash the party. Tiny Colorado College, with fewer than 2,000 students, won a pair of titles in the 1950s. Michigan Tech, known as much for its geographic isolation as for its renowned engineering school, beat Boston College and Minnesota to claim two of the Huskies’ three national titles. RPI, another renowned engineering school of limited enrollment, won a title in the 1950s and another in the ’80s. When Lake Superior State beat St. Lawrence in the 1988 title game, the combined enrollment of both schools would’ve filled less than five percent of Michigan’s football stadium. The Lakers would go on to win two more titles in the 1990s, but then head coach Jeff Jackson’s teams would be the last of the “small miracles” for more than a decade. From 1995 until the end of the 2000s, the Frozen Four was all but the exclusive property of the “big” schools, as Boston University, Michigan, North Dakota, Maine, Minnesota, Denver, Wisconsin and Michigan State claimed every Frozen Four crown for more than 15 years. It wasn’t until 2009 that tiny Bemidji State made a notable splash in the college hockey world, upsetting Notre Dame and Cornell to reach the Frozen Four in Washington, D.C. While the Beavers did not advance to the title game, they may have provided a roadmap for smaller schools to compete, and beat, the “big boys” on the national stage. A year later it was Rochester Institute of Technology playing the underdog role, beating Denver and New Hampshire, and advancing to the Frozen Four in Detroit. In 2011, Minnesota Duluth ended the “big school champs” trend, beating Michigan in overtime for the Bulldogs’ first NCAA title. A year later in Tampa it was another set of Bulldogs – the ones from Ferris State – taking their underdog act all the way to the national title game, where they fell to Boston College. This spring it was a “hockey first” party in downtown Pittsburgh with a quartet of non-traditional powers competing for their first national title. St. Cloud State, UMass Lowell and Quinnipiac had never before advanced that far. 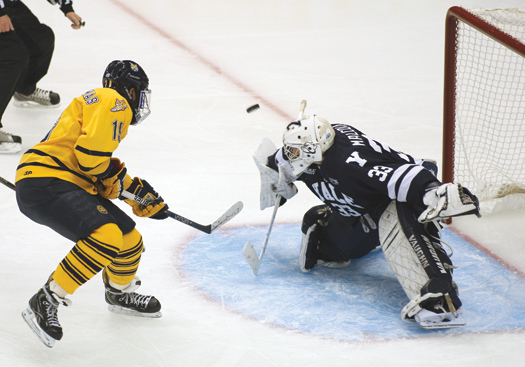 Yale had been to the Frozen Four just once, in 1952, and eventually prevailed by shutting out Quinnipiac in the title game. Is it a fad, or indicative of the new world of college hockey that so many of these smaller schools are seeing success on the national stage? “I think the parity is here to stay,” says RPI coach Seth Appert, who has experienced both large- and small-school hockey programs as a player at Ferris State and as an assistant coach at the University of Denver. Time and again, Appert has seen younger players – those making college commitments when they’re 15 or 16 – “make decisions with their eyes” and choose the flash of a high-profile school that they see on TV over the smaller school experience. By contrast, older and more mature players looking for a college hockey program tend to place greater weight on academics and life after hockey, and are more likely to stay in school for four years, which can be a huge on-ice advantage. When Lake Superior State won its three titles, Jackson was there, first as an assistant coach and then as the head man behind the bench for the ’92 and ’94 crowns. There he commonly recruited older players, and hit the jackpot with future American stars like Brian Rolston and Doug Weight. Now at Notre Dame, the recruits are generally younger, which presents challenges in getting them to commit, and sometimes getting them to keep their commitments. 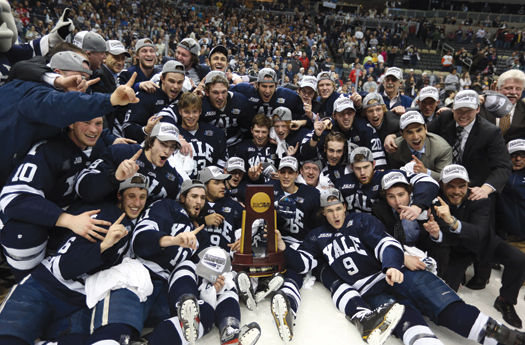 In addition to seeing more senior-laden teams at smaller schools succeeding, Keith Allain, who coaxed that Frozen Four title out of Yale in April, says that schools the size of his also benefit from a crop of available players that is growing every year. 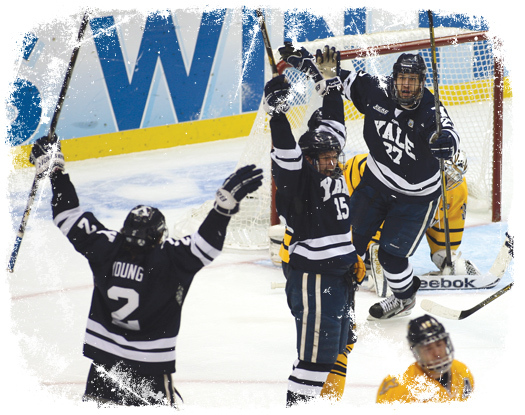 As one college hockey coach put it, 'you win with juniors and seniors,' which is exactly what Yale University did in capturing its first NCAA hockey title. Don Lucia got his feet wet in the coaching ranks at a pair of small schools, Alaska and Colorado College, before taking the Minnesota job in 1999 and leading the Golden Gophers to a pair of NCAA titles. He feels there’s a misperception that college hockey programs in the Big Ten or other “BCS” conferences have significantly more money than smaller schools, saying that the Gopher hockey program brings in significant resources via TV deals, ticket sales and merchandise, but the money goes to the athletic department, not necessarily to the team. Like Allain, Lucia subscribes to the “deeper pool” theory, noting how many more players of college ability there are available now, and not just in the traditional states like Minnesota, Michigan, Massachusetts and New York. Others see young talent continuing to depart those schools early, while the lower-profile programs are able to field senior-laden teams that seem to have so much success every March and April. Jackson, who has seen, done and won pretty much everything one can experience behind a hockey bench, has coined an apt description of the modern college hockey world, where conference alignments, traditional rivalries and the balance of power seems to be changing by the minute. “Consistent craziness,” is how Jackson describes the new world of college hockey, which seems fitting. Jess Myers covers the Minnesota Wild and college hockey for 1500ESPN.com.